The White Stallion, written by Elizabeth Shub with pictures by Rachel Isadora, tells the story of young Gretchen's adventure when she fell asleep on a horse's back while her family was traveling through the Wild West in 1845. Apparently this is a retelling of a story in Tales of the Mustang by James Frank Dobie. Anna sat spell bound through the whole book. I thought she might find it a bit long but she loved it. 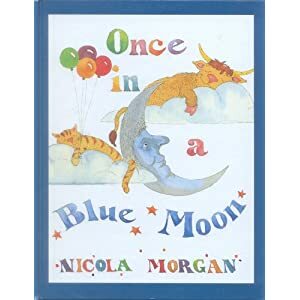 Once in a Blue Moon, written and illustrated by Nicola Morgan, is an amusing story of an old lady who celebrates her birthday with some good friends. What makes the story amusing and interesting is that the story is told using so many familiar, and sometimes silly, sayings. It starts describing Aunt Floydie as being "old as the hills" and "fit as a fiddle" . Anna got a kick out of the pictures, especially the one of the mayor with his foot in his mouth, while I was quite amused by the text. Dreamstones, written by Maxine Trottier and illustrated by Stella East, is a mystical story set in the Arctic. David, a young boy, goes on a trip to the Arctic with his dad and gets lost one night when he leaves the ship to chase a couple of foxes across the ice. He is helped by a mystical man and is found safe and sound next to an Inukshuk. The illustrations are beautiful and add to the mystery and intrigue of the book. Anna and I both enjoyed this book. While I'm not normally a fan of mystical stories I kind of liked this one. In The Big Orange Splot , written and illustrated by Daniel Pinkwater, Mr. Plumbean lives on a street were all the house are just alike, until the day a seagull drops a can or orange paint on Mr. Plumbean's house, leaving a big orange splot on his roof. His neighbours complain about the spot and want Mr. Plumbean to get rid of it but instead the splot inspires Mr. Plumbean to express his individuality. This causes all kinds of changes in the neighbourhood. Anna and I both enjoyed this book. The story and illustrations were fun. It gave us a chance to talk about the importance of being free to be you. I Feel Orange Today, written by Patricia Godwin and illustrated by Kitty Macaulay, is a book that talks about how colors can reflect our moods and ends by saying that "most days are really a rainbow". Anna and I thought it was an okay book. I liked the fact that it got us talking about how different colors make us feel sometimes and how sometimes people use colors to describe how they are feeling. I especially liked the last sentence about most days being a rainbow. The Walking Stick , written by Maxine Trottier and illustrated by Annouchka Gravel Galouchko, tells the story of a boy in Vietnam who finds a walking stick near a Buddhist temple. The walking stick becomes his companion in life and travels to him to Canada to live before he passes it on to his granddaughter. She then carries the stick back to Vietnam with her during a visit there. Anna seemed to enjoy the book. I had mixed feelings about it. There were some parts that I liked and some I didn't. The illustrations are interesting and we spent a bit of time checking them out. Jonathan James Says "I Can Be Brave", written by Crystal Bowman and illustrated by Karen Maizel, is a one in a series of Jonathan James Learn to Read books for beginning readers. It is a short chapter book with 4 chapters about different situations where Jonathan needed to be brave. The chapter titles are The New Bedroom, First Grade, Lost, and Weekend at Grandma's. Jonathan is reminded that God never sleeps and is always with us. Anna and I both enjoyed the stories in the book and it was a great chance to remind Anna to trust in God. I especially liked when Jonathan was going to sleep and he reminded himself that God was awake and was watching over him. I also liked when someone reminded Jonathan that you can never be lost from God. I think those are great reminders even for adults.